Here we are with another installment of “365 Things to do in Cincinnati” and today we are featuring a place that is sure to have you jumping for joy…. Sky Zone in Springdale. 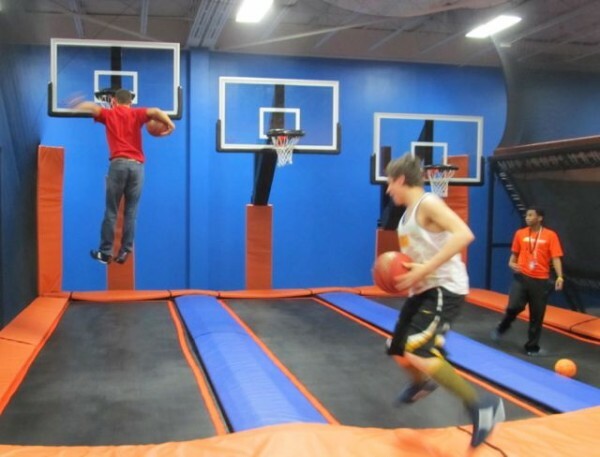 Sky Zone is a new indoor trampoline park that is full of action packed fun potential. We recently went to see Sky Zone for ourselves and were blown away by the place! 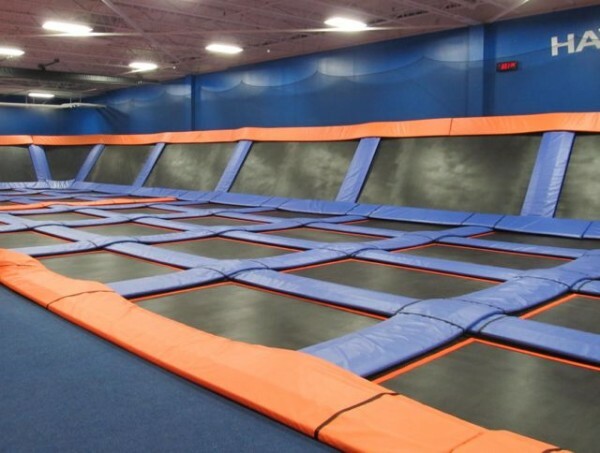 The space is basically wall to wall trampolines! 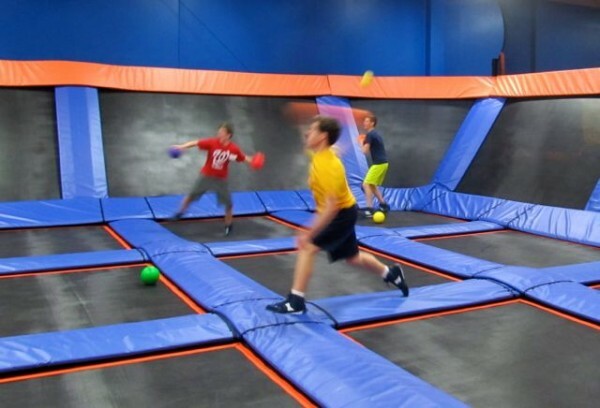 You can have fun at any of Sky Zone’s 5 courts: a large main court, a SkySlam court (shown above with basketball hoops), a Foam Zone, and two Dodgeball Courts (pictured below). Or perhaps you’re more of a mild-mannered jumper and would prefer to try out the main trampoline? It features sloped sides to allow you to try out your flippin’ moves. And if you can believe it, they actually have SkyRobics here. Talk about a workout! In addition to open jump time, they offer Toddler Time, Jumpapalooza (select nights and times), Family Fun Day Sunday (select Sundays), and more. See their programs page for full details. Click here for Sky Zone hours of operation and for more information on their pricing. Please note that waivers are required for all jumpers. Those under 18 must be signed by their parent or legal guardian. Click on the “Before you Jump” info available on their site before arriving at Sky Zone. Want to experience Sky Zone for yourself? Enter below to win a pack of five “1 hour free” jump time coupons! Congrats to our winner – Stephanie E. You have an email from me in your inbox! Who will you take to Sky Zone in Springdale ??? We will choose the winner (at random using Random.org) on Friday, June 21, 2013. This particular prize is a five pack of “1 Hour Free of Jump Time” coupons for Sky Zone in Springdale. Pesky details: Each ticket is good for one hour of jump time. The coupon does say “Restrictions may apply” but I could not find anything further about that. We will email the winner at the email address provided. The winner will have 12 hours to get back to us to claim the prize. If we don’t hear back from the winner within 12 hours we will choose a new winner. No purchase is necessary. Disclosure: The kind folks at Sky Zone in Springdale gave us these tickets to give away. They also provided 365Cincinnati with admission to Sky Zone so that we could write this post. I want to take my son and nephews. I would totally take my 7 year old son. His mind would be BLOWN! My teenage sons would love to go! I will take my neighbors!!! I would take my son and his friends! What a great way to get out their energy and get lots of exercise! I would take my five year old son. He loves trampolines! I would take my three grandkids and two of five neighbor kids. I guess I’d pay for the other three. This would be AWESOME!!!! I would take my girlfriend. This looks like a blast. I would take my two kiddos! I would love to take my hubby and two toddlers, they need to jump off some energy! Looks like a great place! I have four boys and this would make me the best mom in the entire world in their eyes!! I would take my boyfriend so we can have an amazing date! My 12 year old stepson and my husband. Hopefully it’s less painful than paintball ! I will take my son, age 7, and daughter, age 9. They will love this! My kids and husband too. Looks like fun! I would love to take my boys and two of their friends! This place looks awesome! I would love to take my two rockstar nephews and a friend for each of them!!! Fingers crossed! I’ll take my husband – should be hilarious fun! My daughter, niece and nephew! I would love to take the hubby and daughter. I am taking my little sister. Mi 4 kids without a doubt! They would for sure be jumping for joy! Looks awesome!! I would take my two sons and their two cousins! I will take my family – my crazy, dancing, bouncing, tiggerrific family!! I would take my friends and their daughter! She would have a blast. I will take my 3 boys and their friends! I would take all my kids (4) plus me!!!!! Kids would so love this! My son and his friends (not to mention my husband) would love this place! I have three boys who would absolutely love this! I want to take my hubby for a fun date. Haven’t been on a date since before October. I would love to come jump with my son, Logan!! We are having a family staycation later this summer with my brothers coming from out of town. I will take my brothers and their kiddos! Man oh man! I never even knew this place existed! Even if we don’t win the passes, I’m taking the Against the Grain Scholars fer sher! If I win I will take my daughter. Of course my 2 kids and they can each bring 1 friend – perfect for 5 of us! Sounds fun! My wife, kids and nephews are planning a trip today. I would take someone who has the same sense of fun adventure as I do! I would take my grandkids, they’d love it! If I win I will MOST DEFINITELY be taking my nephew! We were just talking about this place last week when I asked him what he wanted to do for his birthday. It looks like so much fun! I will take the kids I babysit! I will take my boys. I would take my son and his friends. He was supposed to go there on June 12th for his 12th Birthday but broke his left foot the day before! He and his friends were sooo disappointed! I want to take my wife and our friends. My wife swears she was a gymnast and we all love to play basketball. This place appears to be Heaven on Earth! My husband and kids!! The perfect summer family activity that gets everyone moving! How fun!! My husband and my 2yo daughter! She would love it! I need to find something that will tire my 7 and 4 year old boys! iI suppose I would take my kids. if only to shut them up for an hour! I would love to take my kids 8, 2, 1 they all love to jump and beg me to get them a trampoline for our house. I will be taking my kids – they love that place! My grandkids and my friends kids, it would be a blast! I would take my kids and my niece and nephews. My kids LOVE to go and have been wanting to take their cousins. I will bring anyone who wants to have a goid time. Sounds fun! I’d take my two kids and a friend for each. I will take my kids and my best friends kids! I will take my kids and the neighbor kids!! I would take my buddy Max! The kids want to go but may be I’ll just these for myself.